If you are collecting the new additions to the Deco Gardens series of bonus blocks I have just added a new one. This is the Thistle. 12" finished block size. A very delicate looking block with LOTS of little applique pieces! Yea, just what you needed on a cold January day! I like it in the white background, but the black background is also pretty. And a four block pillow or wall hanging would be very distinctive. You can get this new Deco Gardens Bonus Block 14 Thistle Block HERE. 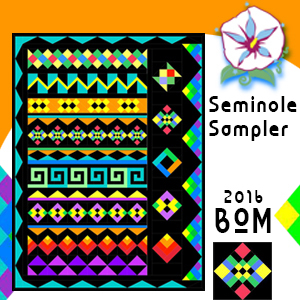 Have you downloaded you free Seminole Sampler Block for the new 2016 BOM? It is still available on the 2016 BOM tab at the top of the page. Want to link your blog to this BOM so you don't forget to download your block every month? 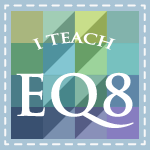 Here is a Blog Badge to post as a reminder. Don't forget to enter the drawing for a free Aurifil Thread Pack by leaving a comment on the 2016 BOM page and filling in the Raflecopter entry. The thistle block is so lovely! 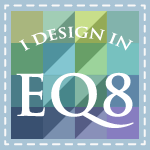 I want to make this deco quilt with all your gorgeous blocks! I've printed January's band and put the badge on my blog. Thanks for the change. I don't do complicated applique, even fusible--not a fan of the prep needed. 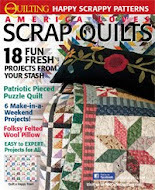 I do love a touch of applique on the quilts, tho. I think it softens them up alot. Reese: I love this thistle pattern and want to purchase it. Question though - I want to make it slightly bigger and use it for a pillow. I'm thinking I can simple enlarge your pattern pieces. Would there be any problem with doing this? Thanks.